Suspected Abu Sayyaf bandit Saad Samad Kiram is now detained at Camp Bernido in Tagbilaran City (left photo). 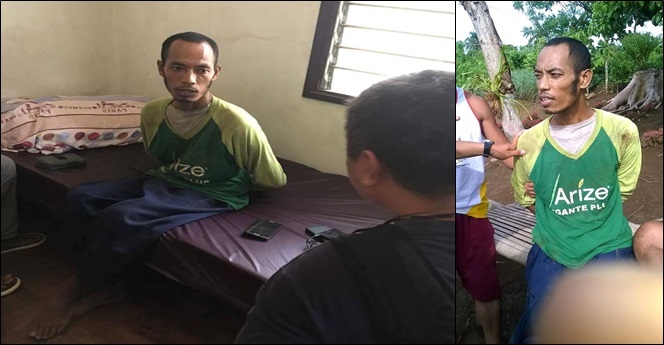 An official of the Bohol Provincial Police Office (BPPO) confirmed the arrest of a suspected Abu Sayyaf bandit at a remote village in Tubigon at 7 a.m. on Thursday. The militant, identified as Saad Samad Kiram, 36, alias “Abu Saad” was allegedly armed with a pistol but did not resist arrest, said a BPPO Provincial Intelligence Branch police officer who spoke in condition of anonymity. According to the source, Kiram asked residents in Barangay Tan-awan, Tubigon for food prior to the arrest at 7 a.m. The son of a female villager reportedly obliged and fed the bandit while the woman secretly left their house to notify soldiers stationed near the area. Kiram is now under the custody of security forces and has been transferred to Camp Bernido in Tagbilaran City for interrogation. Reports on the arrest of the militant has also been confirmed by the Criminal Investigation and Detection Group-7 which is already mulling the filing of charges against the arrested bandit. The military has yet to release an official statement regarding the incident.